Note: This recipe for quick and easy pizza dough contains affiliate links. Read my disclosure policy here. 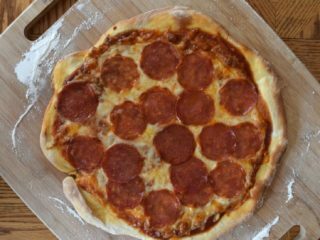 Whip up a batch of this quick and easy pizza dough with just a few simple ingredients in under 30 minutes. This is the perfect recipe to make with your kids or to start experimenting with yeasted breads. We have an standing family date night where we make pizza and watch a movie together. 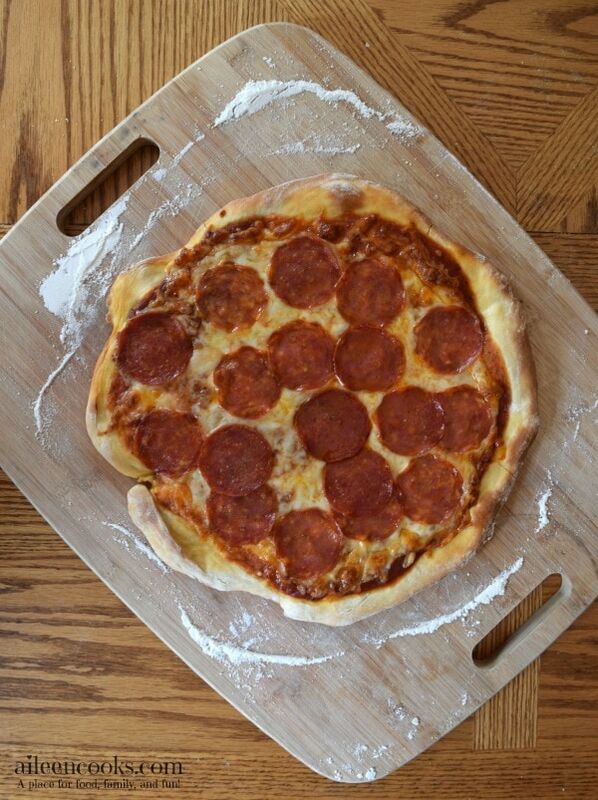 Sometimes we make frozen pizza, but a lot of time we make this homemade pizza dough. It’s easy to make and does not require any rise time (just 10 minutes for the dough to rest), so I don’t have to plan ahead of time and start making it at 3 PM. As long as I have the ingredients on hand, we can whip it up together for an easy meal. It’s a fun tradition that my kids look forward to each week. They love getting to snuggle on the couch (or in our bed) and watch a movie with mommy and daddy. I love it, too. I use it as an excuse to take a break from Cars and Frozen and insist on a family-friendly live action movie. Some of my favorites are Look Who’s Talking Too and Alexander and the Terrible, Horrible, Very Bad, No Good Day. This dough can be made with or without a pizza stone. 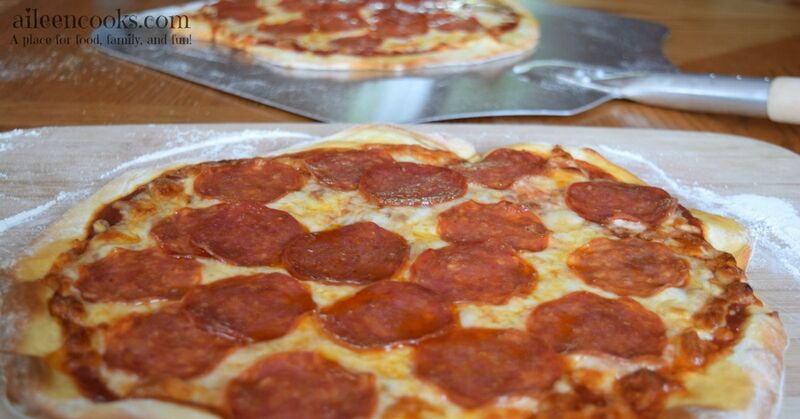 Just follow the directions below and you will have a delicious and homemade pizza in no time. Also, if you’re a visual person, check out my video on YouTube demonstrating how to make the dough. You can also view it below (and check out my super cute helper). Don’t forget to hit subscribe on my channel! 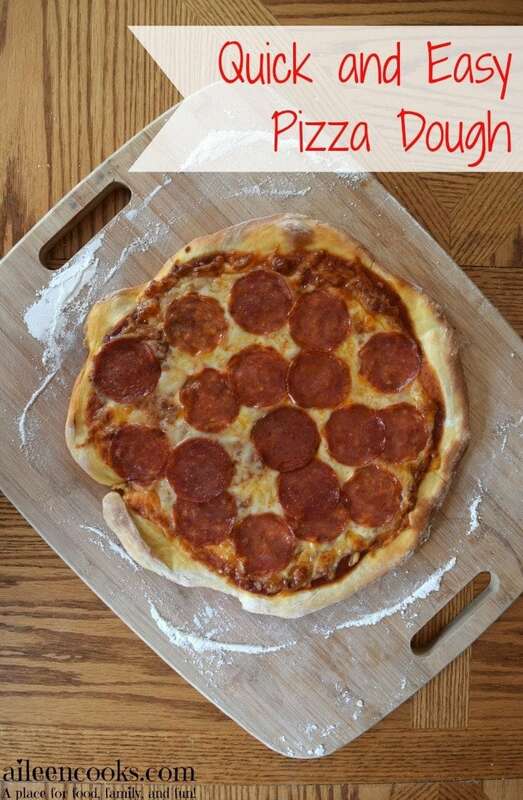 This recipe for quick and easy pizza dough makes two thin crust medium pizza or one thick crust large pizza. Preheat oven and pizza stone (if you're using one) to 450 degrees. Whisk together the warm water, yeast, and sugar until the yeast is dissolved. Slowly mix in the flour, oil, and salt. Start with 2 cups flour and gradually add more flour until a dough forms. Knead the dough for 3-4 minutes in a stand mixer or 7-8 minutes by hand. Divide into two and roll out. If using a pizza stone: add sauce, cheese, and toppings of choice. Slide onto pizza stone and bake 8-9 minutes. If not using a pizza stone: press pizza dough into a rimmed cookie sheet. Bake in the oven for 3 minutes. Remove from oven and add sauce, cheese, and toppings of choice. Return to oven and bake 8-9 minutes. Repeat with second half of dough and repeat. 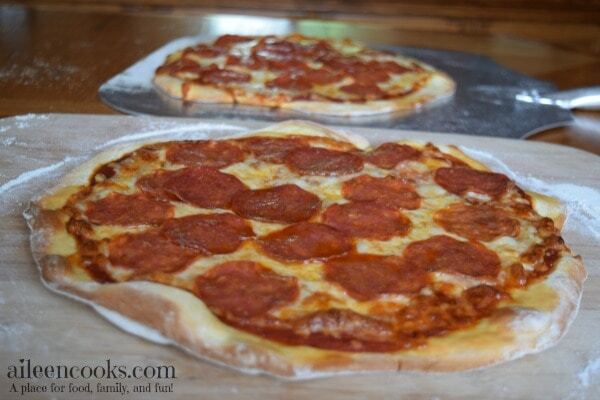 Did you try this recipe for quick and easy pizza dough? Please consider leaving a rating and comment.